Miniature schnauzers may be small dogs. But what they lack in size, they more than make up for in personality. These robust, mustachioed terriers are fun, humorous, and eager to please, making them a joy to be around. But will their price tag have you singing the blues? Miniature Schnauzers are a popular breed for a reason - they are arguably the biggest extrovert in the canine kingdom. Originally bred down to catch rats, this spunky pooch is much more submissive than its standard and giant cousins. Its size, playfulness, and constant desire to be near loved ones make it an excellent family dog. So, How Much is this Bundle of Joy Going to Cost You? There is quite the range when it comes to the cost of mini schnauzers. On average, you can expect to pay anywhere from $500 to $2,700 for your playful little guy. Obviously, if you are interested in acquiring a show-quality dog, it’s going to cost you more cash. 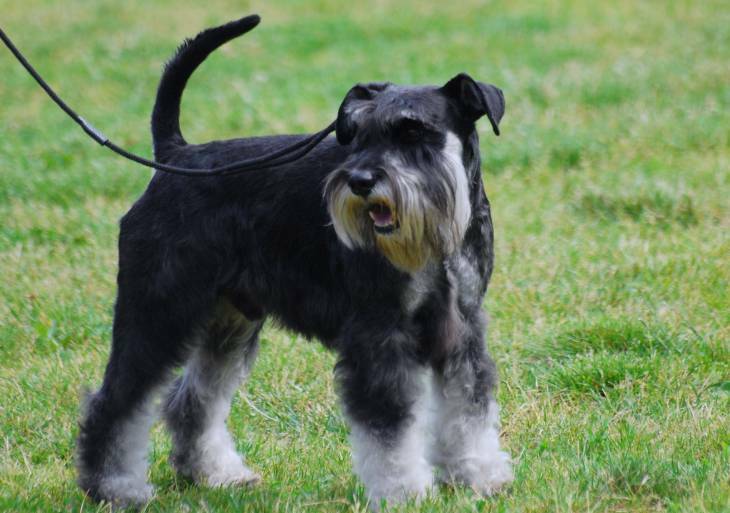 The good news here is because mini schnauzers are a popular and readily available breed, you probably won’t have to worry about shipping costs or other extra costs associated with rare breeds. Of course, you will have to set aside money for licensing fees, vet visits, and other usual costs associated with bringing in a new pup to your home. If you bring a miniature schnauzer into your home, expect him to be with you for a while. The mini's average lifespan is 12 to 14 years. Even with this longevity, there are a few a chronic ailments that can affect your puppy - and ultimately your wallet - during his lifetime. Miniature schnauzers are particularly susceptible to eye issues, with the most serious ailment being cataracts. Other ocular diseases typical in mini schnauzers include retinal dysplasia, glaucoma, and lens luxation. Perhaps the most serious problem you may encounter with your mini schnauzer involves urinary stones, which are more common in minis than in any other breed. This is particularly a problem with male minis because their urethra is narrow and can be blocked easily. This could be a life-threatening emergency, and it could be expensive to rectify. From a grooming standpoint, tending to your miniature schnauzer to maintain his distinctive bearded look is going to take some time. If you’re nervous about botching his distinctive look, you may want to get a professional groomer involved. This could cost you a pretty penny over the course of your pooch’s long lifetime. Miniature schnauzers will cost you more time than you may realize. They might be small, but they are lively. So it may surprise you to find out that your little guy needs a whole lot of exercise to properly placate his energy. A quick jaunt around the block will simply not suffice with a mini like it might with other small dogs. It’s important that you adhere to their needs in this situation. If you don’t, this clever pooch will use his inherent smarts to get into all sorts of mischief. Unfortunately for you, his idea of self-mirth may result in you having to replace a couch or a row of gardenias in your backyard. Also, a miniature schnauzer may cost you a good deal of alone time. Minis love to be a part of every single thing you do, and he'll follow you everywhere - even to the bathroom. This isn't a sign of dependence - he's not a lapdog - but it is a sign of loyalty. Expect to spend a large chunk of time working on your mini to curb his barking. This breed is one of the yappiest dogs in the canine world, and it could drive you and your neighbors bonkers if you don’t put in the proper amount of time to teach him how to keep quiet. If you have the willingness and wherewithal to bring a miniature schnauzer into your home, you’ll be hard pressed to find a dog that’s more loyal and lovable. You and your family will be enamored by his natural charm, wiry coat, and distinctive beard. He’ll be enamored with you, too - something you’ll discover the first time he tries to follow you into the bathroom. My husband and I have a miniature schnauser. His name is Wilson. He was a stray. He showed up in our backyard on Dec. 13, 2010. After reading your description of the normal behavior of miniature schnausers, I just had to comment that Wilson behaves just the opposite. He is so quiet, that we hardly know he is here. He loves to cuddle and the only time he wants to go out is for his daily four block morning walk. The fact that he is probably nine years of age or so may be part of his inactivity but I think it is just natural for him. He has yearly checkups and according to those findings, is very healthy. He is a true treasure. We also have two adult cats and he has befriended not only them, but the neighbors’ cats as well. He however, does have a “Napolian” complex with larger dogs and wants to be the aggressor, which of course, we do not allow. We love our little guy and can’t imagine what we ever did before he found us.